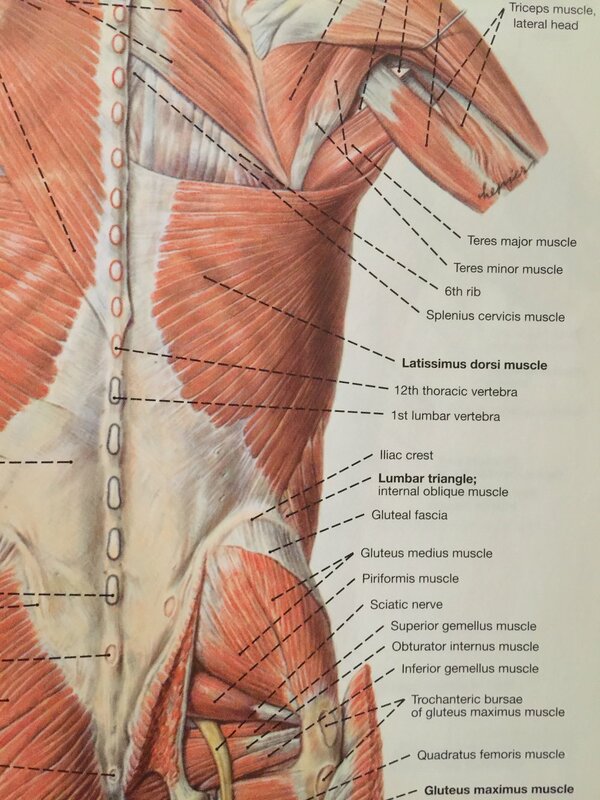 In part two of my fascial layers blog, I wrote about aponeuroses being thick sheets of connective tissue that serve as attachment sites for some muscles. One of those muscles that has a point of origin on the thoracolumbar aponeurosis is the very large, thin and superficial back and arm muscle known as the latissimus dorsi, or the lats. This muscle is particularly interesting for a few reasons. One, while most of its fibers are found covering the majority of the lower and middle back, it’s actually an arm mover. The lats connect the pelvis to the upper arm bone to create medial rotation, adduction and extension at the glenohumeral joint, which is the ball and socket joint more commonly known as the shoulder joint. The actions of the latissimus dorsi are easy to remember if you can remember that it’s the handcuff muscle. If you were being arrested and handcuffed (and I hope you never are), your arms would be medially rotated, a little bit extended and also adducting across the midline behind you. The main actions of the lats are medial rotation, adduction and extension of the shoulder. If you stand or sit upright with your arms relaxed heavily by your sides and turn the palm back behind you or spin your thumbs back behind you, that’s medial rotation of the shoulder. If you reach both arms back behind you, that’s extension of the shoulder and if you then clasp your hands, bringing the arms together behind the back, that’s adduction. (Side note: ABduction is when you take away from the midline. To abduct is to take away so it you take the arm or leg out to the side away from the body, that is abduction of the shoulder or hip. ADduction is the opposite, it’s adding to the midline. When the arms are out to the side and you bring them back down, that’s called adduction because you’re adding the arms back to the midline). In addition to being able to move the arm, the lats also assist in lateral flexion of the trunk and can help extend the spine as well as tilt the pelvis anteriorly and laterally. HOW DOES A BACK MUSCLE MOVE THE ARM? The lats have points of origin on the posterior iliac crest (top of the back of your hip bones), the thoracolumbar aponeurosis, the last few ribs (varies in cadavers), the spinous processes of last six thoracic vertebrae and in some people they cross the inferior angle of the scapula as well. That is a huge origin and a lot of words. All you really need to know is that it’s a large and superficial back muscle that originates on the pelvis, ribs, spine, fascia and sometimes the scapula so it can affect all of those things. The second interesting thing about the latissimus dorsi is that from its origin, it thickens around the armpit and wraps underneath to insert on the front of the upper arm bone in the space between the greater and lesser tubercles of the humerus called the intertubercular groove. The lats form the posterior wall of the axilla, which is the fancy word for armpit. You can feel for these more lateral fibers by taking your right hand to find the back flap of your left armpit and gently pressing your elbow in to your side to engage the fibers. A third interesting thing is that the lats have a helper, a smaller muscle that does exactly the same thing to help get the job done. This muscle is called teres major, not to be confused with teres minor which is just above it and rotates the shoulder in the opposite direction. Teres major originates on the inferior angle of the scapula (as the lats sometimes do too) and the lower third of the lateral border of the scapula. Just like the lats, teres major wraps under the armpit to also insert on the front of the arm just distal to the intertubercular groove at the crest of the greater tubercle. It doesn’t affect the trunk or the pelvis because it doesn’t cross them, but it does medially rotate, extend and adduct the shoulder. Both the latissimus dorsi and the teres major are handcuff muscles. WHEN ARE THE LATS + TERES MAJOR CONTRACTING? When you grab onto a pull up bar and pull yourself up, the lats and teres major are contracting (or shortening) which means the origin is working to bring the insertion toward it to complete one, some or all of the actions. When the hands are clasped behind the back, the lats and teres major are also contracting as the shoulder is medially rotates, extended and adducted. People with really developed lats may have a hard time clasping their hands behind their backs because of high motor tone and lots of dense muscle fibers. WHEN ARE THE LATS + TERES MAJOR LENGTHENING? Child’s pose with the arms stretched out in front is a nice stretch for the lats and teres major. You can walk the arms and upper body off to one side to deepen the stretch on the other and vice versa. Any time you are reaching the arms overhead, the lats are stretching.